I cant believe noone wrote review for this so i will make short one. This is Sci-fi show with unique story following" space police" if you can bear spaceships that are designed as trains this is such a gem give it a try. Characters most characters in this show are well designed except 2 main chars yuuki and his fan girl, loved killian and david. Overall i enjoyed this show a lot great fun give it a go. Following on from the original series and the OVA Galaxy Railways II presents a rather mixed bag. The story takes a much more episodic approach compared to the first and while some are certainly interesting it's fair to say many are not. 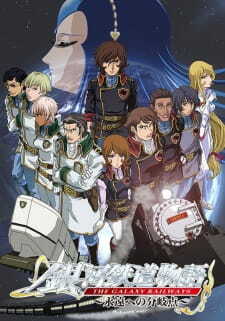 Eventually the series does get an actual continuous plot that takes the show to the end and this is actually a pretty interesting sub story with lots of fun ideas and decent action but running about only 6 or so episodes at the end it's not enough to save this show from a sort of going through the motions vibe. I did still enjoy the series as I'm such a huge fan of the Leijiverse in general so the general style and atmosphere of these shows tends to win alot of favor with me where in others it might not. I was willing to overlook the lack of a compelling story but your mileage may vary. Do you remember Hunchback of Notre Dame? Well, do you remember Hunchback of Notre Dame 2? If you did watch that sequel, then expect the same quality in this sequel. Galaxy Railways 2 dropped its quality so low that Skrillex would be in awe. It basically took out all the life that the first season had--the characters are incredibly bland, the art and animation is deader than George Washington, it shifted to a more episodic approach. Each episode lends nothing to the main plot, and some are filled with senseless gags and poor attempts at comedy. New characters that appeared this season are completely useless to the cause. Galaxy Railways 2 is a pointless addition to the series, and no one should suffer through it. The first season is so good, but this one will have you disillusioned and leave you with a bitter taste in your mouth. Don't bother with it, Jesus didn't die for this to happen.